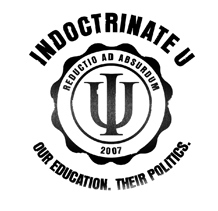 In brief, a lawyer representing Indiana University wrote to Maloney’s company early last month claiming that the “Indoctrinate U” logo was similar to IU’s. Maloney does not concede the claim of infringement, arguing that differences between the two logos are “readily apparent” and that in any case his movie does not compete with IU’s educational offerings. But he decided to stop using the logo anyway, figuring it was cheaper than fighting. “In an act of good faith, we voluntarily took the Indoctrinate-U.com site offline while we reviewed our options,” he writes. He didn’t publicly name the university because that “would have caused needless controversy and made it harder to reach a mutually agreeable resolution to the dispute.” The Web site returned once the logo had been stripped from it, from the promotional videos and from the movie itself. The university is now demanding we hand over a sum of money that would essentially bankrupt On The Fence Films. I have to say, I’m a bit stunned. I understand that some academics might have a problem with our film; it covers academia’s dirty little secrets. Nobody likes to be criticized. But Indiana University is not mentioned in the film at all! So their heavy-handedness seems a bit extreme. He’s stunned because, ironically, he forgot — despite making this film — that universities are big business, and are among the biggest IP pigs around. Okay, I can’t deny that the original Indoctrinate U logo is probably confusingly similar to the Hoosier’s symbol — but there’s been no harm, no foul (i.e., no damages and presumably no evidence of bad faith infringement). 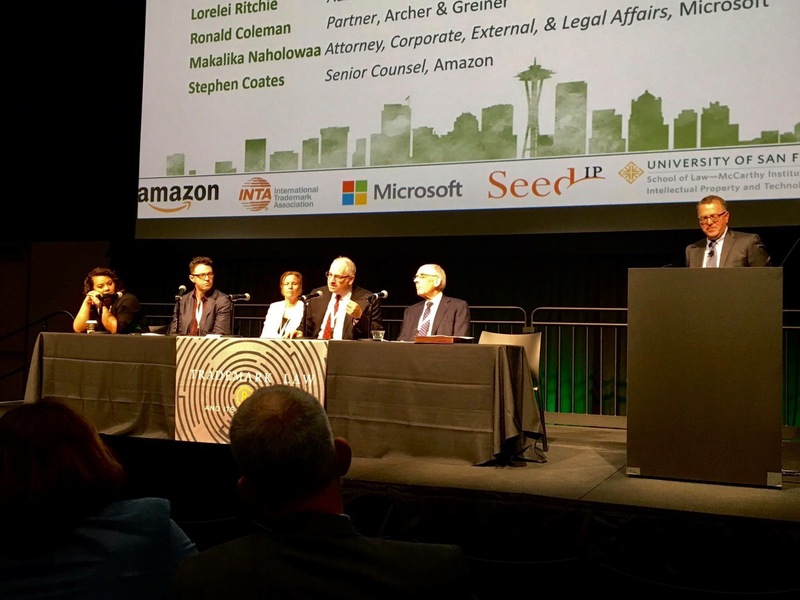 I’ve pushed back on these shakedowns before and seen institutions with “IP programs” that depend on a positive cash flow back off on the money demand. Perhaps a little negative publicity would help that happen here. I find it hard to believe that Indiana University knows or cares much about the content of this film. More than likely the money demand is just to cover the attorney fees associated with protecting the IU trademark. The fact that it would “bankrupt On the Fence Films” probably speaks more to On The Fence’s low budget and/or the increasing cost of attorneys. Yes, universities are big businesses, but they would prefer to spend their money on educating students, not fighting off clearly infringing trademarks. I wouldn’t be so quick to concede confusing similarity. In the world of higher education, there are many schools that share identical acronyms – is USC in CA or SC? OSU in OK, OH or OR? MSU in East Lansing or Bozeman (or Starkville)? US consumers of higher education (and its athletic symbiote) have become accustomed to focusing on fine distinctions among the universe of higher education trademarks – if the S is red its Stanford; orange, Syracuse; green, (Michigan) State. Indian may not like it, but there’s no confusion here. But Bob, the logo, not the initials. You have to argue, I think, that there is no trademark at all to argue not LOC. Kenan, I agree, there is no political motive here by IU. It’s just an IP pig being an IP pig. They have succeeded in “fighting off” this infringement — they’re not entitled to damages, and the only reason they think they have the leverage to get them is that they’re threatening to impose the cost of litigation on a defendant with virtually no resources. Indiana University has taken a ridiculous position. The logos are entirely distinct when taken as a whole, and there are ample free speech and fair use considerations here, even if the filmmaker had intended to refer to or conjure up the image of Indiana University. If I were the film-maker, I probably would ignore the claim for money, as I cannot imagine Indiana University being so stupid as to sue over this. But Mike, that’s the problem faced by the defendants of the world. If they ignore the threat, they will be sued, and will have to put up a meritorious defense — even if you’re right on the merits — or default and get a judgment entered against them. That defense costs a lot of money for most people. And the courts (and Congress) have no problem with this state of affairs. I’m not sure you’re right about the logos, though. Well Ron, what about the allcaps INDOCTRINATE U, and REDUCTIO AD ABSURDUM? I don’t speak Latin, but that screams PARODY to me, especially given the context of the movie. Many more threats of suit are made, than suits actually filed. I would hope the reasonable folks at IU will prevail over their TM police, and would not permit a lawsuit to be filed, which will only give the film more publicity and give bad publicity to IU.